Artur Rodzinski was born in Split, the capital of Dalmatia on New Years Day - January 1, 1892. His father was an army surgeon moved his family to to Lvov in 1897, and it was there that Arthur started his musical studies. He completed a Law degree at the University of Vienna before he dedicated himself completely to music. He studied composition at the Conservatory with Josef Marx and Franz Schreker and orchestral conducting with Franz Schalk and piano with Emil von Sauer. 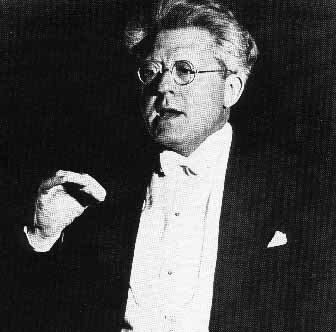 Rodzinski returned to Lvov and found a job as choral director and conductor at the Municipal Opera in 1920. For his debut he conducted Verdi: Ernani. The following year, he conducted at the Warsaw Opera, where he gave the first performances of Strauss:Der Rosenkavalier, Wolf-Ferrari:Jewels of the Madonna and Ravel:L' Heure Espagnole. He was began to give concerts on a regular basis with the Warsaw Philharmonic. Leopold Stokowski met Rodzinski on a trip to Poland and invited him to perform his first US concert in Philadelphia in at the Curtis Institute he was placed in charge of conducting its opera and orchestral programs. By 1929, Rodzinski was in charge of the Los Angeles Philharmonic. He served until 1933, garnering positive reviews for his characteristically eclectic programming. In 1933, he was asked to take over as director of the Cleveland Orchestra. During his tenure in Cleveland he turned the orchestra into a virtuoso ensemble matching the standards of the New York, Boston and Philadelphia Orchestras. In Cleveland, he recorded for Columbia a wide repertoire which reflected his broad tastes. He was an active defender of modern music with many performances of works by European and American composers. He was an early champion of the music of Shostakovitch. During 1933-1943, his decade in Cleveland Rodzinski had turned that city's orchestra into an ensemble of the first rank. Among his achievements were an ambitious recording programme and the creation of an opera series, which included the American premiere of Shostakovich: Lady Macbeth of Mtsensk in 1935. His Cleveland years gave him a world-class stature and in 1936 Rodzinski became the first American to conduct at the Salzburg Festival (he had become a naturalized citizen of the USA in 1933). In 1936 and 1937, while conducting in Vienna and at the Salzburg, Toscanini became greatly impressed by Rodzinski's rehearsal techniques. Almost immediately, Toscanini asked Rodzinski to help form the NBC Symphony Orchestra for him. Rodzinski's acclaim was phenomenal in the United States during the 1930's and 1940's. In 1937, he was invited to spend two months giving concerts with the New York Philharmonic. In 1942, Rodzinski was appointed music director of the New York Philharmonic. In 1943, Rodzinski had secured his long-held wish to become Music Director of the New York Philharmonic but during his next four years with the orchestra he had an open battle over hiring and programming with Arthur Judson the orchestras manager. Rodzinski had fired 14 musicians including first chair when he took over directorship and four his years in New York were marked by acrimony as well as musical excellence. In 1947 he asked the board to choose between him and Judson and they released Rodzinski from his contract since he could no longer tolerate Judson. Rodzinski had secretly negotiated with the Chicago Symphony Orchestra to become their music director. Chicago was only too happy to hire a talent like Rodzinski, yet he was dismissed eleven months later over "programming" disputes. Unfortunately, Arthur Judson was also director of one of the most important North American artists representation agencies and his influence extended to Chicago also. Rodzinski was still paying for his refusal to disagree with Arthur Judsons lower musical standards. The scandal of his secret negotiations had angered Judson and Rodzinski had only signed a one year contract with Chicago in his hurry to leave New York and Judson. Every orchestra Rodzinski touched in America had become a better ensemble .. even his one year in Chicago had improved the orchestra greatly. 1948 proved to be the darkest year of Rodzinski's life...in addition to being forced to leave Chicago, he developed a serious health problem which also had an effect on his by now frail emotional status. For the next ten years, Rodzinski returned to his career as a guest conductor, returning regularly to Europe. In Italy, he conducted many first performances of Operas (especially Russian Operas... Prokofiev, Shostakovitch, Mussorgsky etc.). During this period he made many recordings for the Westminster label as well as EMI. His recordings with the Philharmonic Symphony Orchestra of London are still held in high regard both in terms of performance values and their fine sonics. In 1958, he gave excellent performances of Khovanshchina at the Rome Opera and Tristan and Isolde at the Chicago Lyric Opera just two weeks before his death. Artur Rodzinski died in a Boston hospital on November 27, 1958 just short of his 67th birthday. Rodzinski's conducting style was austere with slender gestures and a contained style similar to Arthur Nikisch or Fritz Reiner (his contemporary and then successor at the Chicago Symphony. Artur Rodzinski è stato sopportato nella spaccatura, il capitale di Dalmatia il giorno di nuovi anni - 1 gennaio 1892. Il suo padre era un esercito che il chirurgo ha spostato la sua famiglia verso verso Lvov in 1897 ed era là che Arthur ha iniziato i suoi studi musicali. Ha completato un grado di legge all'università di Vienna prima che si dedicasse completamente a musica. Ha studiato la composizione al conservatory con Josef Marx ed a Franz Schreker e condotta orchestral con Franz Schalk e piano con Emil von Sauer. Rodzinski restituito a Lvov e trovato un lavoro come il direttore e conduttore choral all'opera comunale in 1920. Per il suo debutto ha condotto Verdi: Ernani. Il seguente anno, ha condotto all'opera de Varsavia, dove ha dato le prime prestazioni di Strauss:Der Rosenkavalier, di Wolf-Ferrari:Jewels del Madonna e di Ravel:L' Heure Espagnole. Era ha cominciato a dare i concerti in maniera regolare con Varsavia Philharmonic. Leopold Rodzinski venuto a contatto di Stokowski su un viaggio in Polonia ed invitato lui per effettuare il suo primo concerto degli Stati Uniti a Filadelfia dentro all'istituto di Curtis era incaricato disposto di condotta la relativi opera e programmi orchestral. Entro 1929, Rodzinski era incaricato di Los Angeles Philharmonic. Ha servito fino al 1933, garnering le revisioni positive per la sua programmazione tipicamente eclettica. In 1933, è stato chiesto di assumere la direzione di come direttore dell'orchestra de Cleveland. Durante il suo possesso a Cleveland ha trasformato nell'orchestra un insieme del virtuoso che abbina i campioni delle orchestre de New York, de Boston e de Filadelfia. A Cleveland, ha registrato per Colombia un repertorio largo che ha riflesso il suo vasto gusto. Era una protezione attiva di musica moderna con molte prestazioni degli impianti dai compositori dell'americano e della European. Era un campione in anticipo della musica di Shostakovitch. Durante il 1933-1943, la sua decade a Cleveland Rodzinski si era trasformata che orchestra di city's in un insieme del primo Rank. Fra i suoi successi erano un programma ambizioso della registrazione e la creazione di una serie di opera, che ha incluso il premiere americano di Shostakovich: Signora Macbeth di Mtsensk in 1935. I suoi anni de Cleveland gli hanno dato un'altezza del mondo-codice categoria ed in 1936 Rodzinski ha stato bene al primo americano da condurre al festival de Salisburgo (era diventato un cittadino naturalizzato degli S.U.A. in 1933). In 1936 ed in 1937, mentre conduceva a Vienna ed a Salisburgo, Toscanini è stato notevolmente impressionato mediante tecniche di ripetizione del Rodzinski's. Quasi immediatamente, Toscanini ha chiesto a Rodzinski per contribuire a formargli l'orchestra di symphony di NBC per. L'acclamazione di Rodzinski's era fenomenale negli Stati Uniti durante il 1930's ed il 1940's. In 1937, è stato invitato a passare due mesi che danno i concerti con New York Philharmonic. In 1942, Rodzinski è stato nominato direttore di musica di New York Philharmonic. In 1943, Rodzinski aveva assicurato il suo desiderio di lunga data per stare bene al direttore di musica di New York Philharmonic ma durante i suoi quattro anni successivi con l'orchestra ha avuto una battaglia aperta sopra assumere e la programmazione con Arthur Judson del responsabile delle orchestre. Rodzinski aveva infornato 14 musicians compreso la prima sedia quando ha assunto la direzione del directorship e quattro i suoi anni a New York sono stati contrassegnati dall'amarezza così come merito musicale. In 1947 ha chiesto alla cartolina di scegliere fra lui e Judson e hanno liberato Rodzinski dal suo contratto poiché potrebbe più non tollerare Judson. Rodzinski aveva negoziato segretamente con l'orchestra di symphony del Chicago per stare bene al loro direttore di musica. Chicago era soltanto troppo felice di assumere un talento come Rodzinski, tuttavia è stato allontanato undici mesi più successivamente di "programming" dell'eccedenza; dispute. Purtroppo, Arthur Judson era inoltre un direttore di una delle agenzie della rappresentazione degli artisti nordamericane più importanti e suo influenza ha estendere a Chicago inoltre. Rodzinski ancora stava pagando il suo rifiuto non essere d'accordo con i campioni musicali del Arthur Judsons più basso. Lo scandal delle sue trattative segrete aveva fatto arrabbiare Judson e Rodzinski aveva firmato soltanto un contratto da un anno con Chicago nella sua fretta per lasciare New York e Judson. Ogni orchestra Rodzinski toccato in America si era transformata in in un insieme migliore. persino che il suo un anno in Chicago aveva migliorato l'orchestra notevolmente. 1948 sono risultato essere l'anno più scuro di vita di Rodzinski's... oltre che la forzatura per lasciare Chicago, lui hanno sviluppato un problema di salute serio quale inoltre hanno avuti un effetto sulla sua ormai condizione impressionabile delicata. Per i dieci anni successivi, Rodzinski ha rinviato alla sua carriera come conduttore dell'ospite, rinviante regolarmente ad Europa. In Italia, ha condotto molte prime prestazioni delle opere (particolarmente opere russe... Prokofiev, Shostakovitch, Mussorgsky ecc.). Durante questo periodo ha fatto molte registrazioni per Westminster identificare come pure EMI. Le sue registrazioni con l'orchestra di symphony di Philharmonic di Londra ancora sono tenute nell'alta considerazione sia in termini di valori di prestazioni che loro sonics fine. In 1958, ha dato le prestazioni eccellenti di Khovanshchina all'opera ed al Tristan de Roma e di Isolde all'opera lyric del Chicago appena due settimane prima della sua morte. Artur Rodzinski è morto in un ospedale de Boston il 27 novembre, short giusto 1958 del suo sessantasettesimo compleanno. Lo stile di condotta di Rodzinski's era austere con i gestures snelli e uno stile contenuto simile a Arthur Nikisch o a Fritz Reiner (il suoi contemporaneo ed allora successore allo symphony del Chicago. Disc 1: Beethoven:Leonore n. 3 Ovt.